Lima Film Festival: Gigante | personal.amy-wong.com - A Blog by Amy Wong. 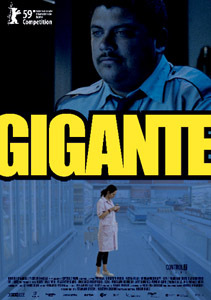 Gigante (Giant – literal translation) tells the story of Jara, a big security guard that works night shifts at a supermarket, who begins having feelings – maybe a bit of stalkery feelings – for the pretty floor cleaner. This is the thing about films, your characters can do anything and you can feel whatever you want~ In the real world, having someone secretly following you around would totally freak you out, but it doesn’t happen in Gigante. Jara sees the floor cleaner through the security cameras, and as days go by he checks on her without her ever knowing. One day he decides to see where she goes when she’s not working only to find out she goes to the Internet cabins, after that he sort of makes a habit out of following her and “watching out” for her, in the process knowing about her likes. He even saves her a couple of times at work, and even defends her honor when some cab driver shouts obscenities/pick-up lines at her – It’s cute in the film, but I don’t recommend anyone trying his moves in the real world. Moreover, I don’t know~ I didn’t feel her. Especially at work, she was absent-minded, and a bit clumsy… actually she exasperated me a bit during her supermarket scenes.